Through a partnership with The Purdue Research Foundation, the Armstrong Family and Neil Armstrong’s friend, Jim Hays, ASF recognizes an Astronaut Scholar Alum who exemplifies personal character and professional achievement, and their work leaves an impact in their field. The nominating criteria embody Neil Armstrong’s core values and those of his colleagues, the Mercury, Gemini, Apollo, Skylab, Space Shuttle and International Space Station astronauts. The Neil Armstrong™ Award of Excellence is awarded annually to an Astronaut Scholar Alumni. This award serves as a prestigious recognition for those who continually push the boundaries in their fields of science, technology, engineering and mathematics. The awarded Astronaut Scholar Alumni exemplifies personal character and professional achievement mirroring the core values of its namesake, Neil Armstrong. 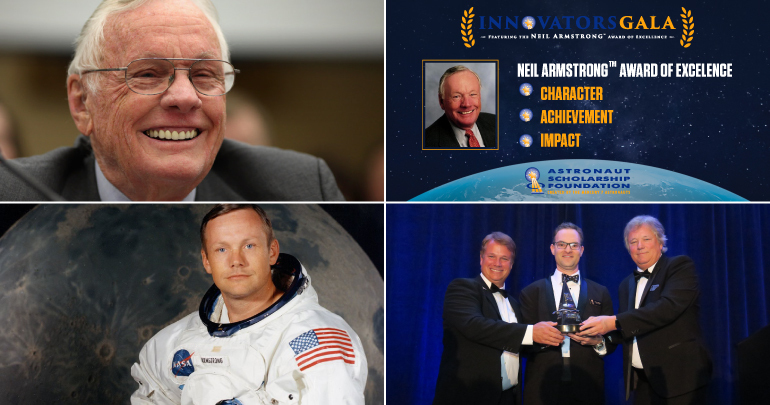 Each year, the Neil Armstrong™ Award of Excellence is presented at the Innovators Gala. Bringing together some of America’s pioneering astronauts and STEM leaders. This year the Gala will be held on August 24, 2019 at the Marriott Marquis Washington, DC with Keynote Speakers to be announced. Nominee must be a past ASF Astronaut Scholar recipient. Nominee must be a U.S. citizen. The achievement, product, technology, or service cited for the award has been widely recognized by others (company, industry, associations, etc.). All applications with completed documentation are due March 31, 2019 by 11:59 PM. Applicants must offer evidence of significant accomplishments in a STEM field. Applicants must embrace and demonstrate a philosophy that fosters teamwork and promotes ingenuity. Applicant should possess traits such as integrity, perseverance, critical thinking, intellectual daring, and a passion for exploration. The nominee will have clearly demonstrated a commitment to the pursuit of excellence. The award will recognize any outstanding accomplishments in STEM fields, including scientific discovery, the development of creative technologies, new and advanced processes and systems, significant patent applications, novel prototypes, and other innovative contributions. The nominee’s achievements should have a demonstrable impact on society through their effect on science, technology, industry, global leadership, or the inspiration of future generations. All eligible applications will be reviewed by the judging committee and the winner will be selected for the Neil Armstrong Award of Excellence by mid-June 2019. All nominees will be notified and invited to attend the Innovators Gala in Washington D.C. on August 24, 2019. The recipient of the Neil Armstrong™ Award of Excellence will be awarded during the gala celebration. Note: Submitting a nomination/application does not guarantee an award. For more information about the Neil Armstrong™ Award of Excellence, contact us at +1 407-362-7900 or info@astronautscholarship.org. Note: Neil Armstrong™ used with permission from The Purdue Research Foundation. 2018 - Larry Bradley, Ph.D.
2017 - Patrick Biltgen, Ph.D.